« If 2016 Wasn’t the Epocalypse, What the Heck Was it? I have struggled to understand George Soros because he is a character riddled with contradiction. His push to break down borders by increasing immigration all over the world is undermining his desire to establish a unified Europe and a unified world. By pushing too hard, too fast, he’s creating obvious pushback. So, I decided to work on an article that would help me get a little better sense of what drives him. On the one hand, he openly acknowledged at the end of 2016 that an “immigration crisis” is busting Europe apart at the seams. On the other, he states that the EU has always been his cherished project. So, why is he pushing immigration to the EU’s breaking point? I see the same contradiction in German Chancellor Angela Merkel. Europe is clearly her favorite project, too, and yet she seems hell-bent on stuffing immigrants from outside of Europe down every European nation’s throat, including her own, to a degree that is clearly over stressing indigenous cultures and creating fractures everywhere. Clearly Europe already has financial fractures that risk busting apart Europe’s always-precarious union of iron bonded together with clay. Do these two leaders thrive on stress so much that they feel compelled to force more discontented and impoverished people into an already fractured vessel? Are they just pathologically inclined toward self-destruction? Are they immigration bulimics who can’t stop stuffing themselves –addicts who have to keep shoving another needle in their arm, no matter the harm? Another full-on euro crisis in 2017 seems like an obvious prediction to me. Why is it not obvious to those who so want the eurozone to succeed? Soros is concerned that rejection of Hillary means the dawning of democracy in the world is being extinguished. Those words tell me Soros will do all he can to rile people against the new US leader who extinguished Hillary’s flame, democratically elected as he was. Here again, Soros is a contradiction, for he is always talking about how important democracy is; but I hope to sort that out in this article, too. Soros laments that his new world order is disordering itself, “first from Brexit, then from the election of Trump in the US, and on December 4 from Italian voters’ rejection, by a wide margin, of constitutional reforms;” but everyone knows these movements are primarily being fueled by the EU’s insane immigration policies. Even in the US, immigration was a main issue. Maybe liberals love these immigration policies, but clearly there are too many people who don’t, and when you try to force feed people on each other, they’re going to throw up on you. 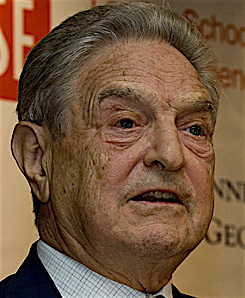 With equal blindness, Soros laments all the fake news that has “disoriented electorates” and “destabilized democracies.” I say it is blindness because Soros does everything he can to destabilize any democracy that is nationalistic by bankrolling riots against any government that is not going along with his globalist dogma. He is both pushing unwanted immigration in mass and financing protests and coups, which makes it seem peculiar that he’s surprised by growing disorder in the new world order. The baldfaced hypocrisy is astounding. What makes Soros tick, and what makes him talk? George Soros states that his overriding cause in everything he supports philanthropically is what he calls the creation of “open societies,” and he states that the one principle he believes can save humanity is pluralism. Without that, he believes we will destroy each other. He witnessed such destruction as a boy in Hungary under Hitler’s occupation where clearly pluralistic cultures were not embraced, and he states those years were formative to his character, as I imagine they would be. Maybe that is what drives Soros to put enormous amounts of money into squeezing people together through immigration, even though he sees that it is creating stress fractures in his beloved European Union. Given the horrors that he witnessed as a child, his need to force pluralistic societies into being could be pathologically driven. But there, I think, is the key failure in his belief system. Soros truly believes he can create pluralistic societies by pushing people together so that people of different beliefs and culture learn to get along. If I were asked what is the greatest common trait humanity has that can save us from each other, I wouldn’t answer “pluralism.” I’d answer that it would have to be love of humanity. In the absence of love for all humanity, pushing people together will only create conflict, but I don’t think Soros understands love. Soros is working like a machine to force something to happen because, like a machine, he doesn’t understand the underlying love that is necessary in order for that to actually work. Given his childhood, as retold in the video below, I believe he truly believes in the value of open societies. I can certainly see where that kind of childhood would make that a belief of fierce importance. By the same token, then, Soros only believes in it so long as those societies are moving democratically toward his unifying principle of pluralism were Jews and Germans, Blacks and Whites, Christians and Muslims can live side by side. If, however, democracies elect autocratic leaders, he prefers to rip them into shreds. Maybe that is how he acts out his pent-up rage against Hitler, and maybe that’s why he has wanted to see so much immigration into Germany. Even in this unmanipulated version of the interview, Soros makes the peculiar statement that it was “not at all” difficult for him to travel with his Nazi protector and watch the man confiscate the property of his fellow Jews. It didn’t trouble him in the least because he wasn’t the one doing it. While Soros was not the one actually seizing the property of his fellow people, as the fake news versions make it sound, I have to think most people with a conscience would experience duress just watching what was happening to their own people. That Soros says it wasn’t the least bit difficult indicates some pathology had already set in … as though he was numb to what was happening or was able to completely dissociate himself from what his Nazi protector was doing. The particularly telling part is when he immediately goes on with a smile to equate that experience of watching the confiscation of Jewish property to being just like his work in financial markets where, if he wasn’t the one causing currencies to break down with his own speculation, someone else would be causing the chaos anyway, so what difference does it make? That is how he has learned to compartmentalize life. Since someone is going to do it, it might as well be him. He admits that he never gives a thought to the morality of his investing or the pain he creates. After causing financial pain to entire nations, he then gives money to build what he sees as better, more pluralistic nations. Like an android who is compelled to do the right thing for humanity by his programming, he doesn’t understand that you cannot force love, so you cannot force people together. You can nurture love, but you cannot force it. The sociopathically broken boy is trying to make society work the way he believes it should. He’s trying to push the pieces together in belief that they should meld. What does George Soros have in store for 2017? These words resonate with the boyhood experience Soros had with Germany’s hegemonic power in Europe back in his childhood. I’m sure he can’t help but feel Germany is at it again. And Trump with all of his impassioned speeches sounds a bit like Hitler to him, as do the racial overtones in Trump’s immigration concerns. Soros is confident that the US has institutional structures that will prevent things from going that far, but he’s convinced Trump would go that far if not for those constraints. So, Soros is going to put all of his power into battling Trump in the years ahead as that, for him, is his battle against Hitler. In other words, I think Soros isn’t just name calling. I think that is how he sees it, and it plays on very deep childhood trauma in his life. Soros is making this prediction in the same manner as when he has predicted crashing currencies. He predicted their fall because his own investments were betting against those currencies. He new he had enough money involved to tip the balance in currencies that already wanted to fall and that his words had enough clout to create further push in that direction. Soros is going to stir the pot for all he’s worth this year and make sure the rage explodes into flames, and he’s got enough money to do a lot of stirring, and the rage already wants to happen anyway. So, that should tell you what you need to know about where the year is going. Soros sees the European Union falling apart, and he sees Putin pushing it in that direction as more elections come along where anti-establishment candidates like Trump are rising in prominence in Germany, the Netherlands and Italy and France. He knows that Trump will encourage those movements, too. So, Trump and Putin are a combined threat to the European union, which Soros avidly supported from inception. Soros put his money behind the Ukrainian coup because he saw Putin as an autocrat with whom the democratically elected government of Ukraine was aligning itself. If Trump is Hitler to him, Putin is Stalin, who overran eastern European nations like Hungary after Hitler left. Soros likes democracies that decide things his way, but Ukraine chose a leader that was reaching for closer ties with Stalinist Putin. Democracy is great so long as it leads to the kind of government Soros believes is best, but must be fought if it leads to nationalism or leans toward autocratic leaders (at least, those that Soros sees as autocratic). Soros says he is concerned that Russia will interfere in this year’s upcoming European elections with with more “fake news.” Ironically, Soros writes, “The trouble is that the method Putin has used to destabilize democracy cannot be used to restore respect for facts and a balanced view of reality.” Yet, Soros seeks to destabilize democracies, himself, with protests and riots that certainly don’t restore any respect for facts or any balanced view of reality either because who is listening for facts or trying to be balanced in the middle of a riot? With economic growth lagging and the refugee crisis out of control, the EU is on the verge of breakdown and is set to undergo an experience similar to that of the Soviet Union in the early 1990s. Those who believe that the EU needs to be saved in order to be reinvented must do whatever they can to bring about a better outcome. He can see the refugee crisis is out of control, and yet he fuels it. He can see it is breaking up his beloved EU, but he keeps pushing in that direction, just as Merkel does. I can only understand this Jekyll-and-Hyde nature as a pathological belief in the virtue of pluralism that developed during the Nazi occupation years that he says formed his character. Others might see it as though he just pretends to care about a refugee crisis, but that he is pushing that crisis because of some other hidden agenda. He seems completely earnest to me when he says these things, and my lie detector is usually razor sharp; so I am inclined to believe he’s not conspiring for world control but really believes in what he’s doing. It is, however, a pathological belief that has raised pluralism as the supreme virtue, which comes from his Jewish experience under the Nazis. When you put the wrong virtue on top of all your values, it usually ceases to be a virtue and becomes a tyrant. If, for example, loyalty is your highest virtue, you will be loyal to the evil leader you serve, no matter what wrongs he does; and that’s how Hitler reigned. I haven’t seen much to indicate that Soros knows love from personal experience. If his character were built on love, he would not have been so indifferent toward seeing property confiscated from his fellow Jews as something that was going to happen whether he was there observing it or not. He also would care about how many people get hurt in the violent protests he finances. Because he doesn’t really get what it takes to make people function together, he keeps trying to push them together to make it work, and he tries to create conflict where he perceives the threat of dictatorship in order to destabilize those dictatorships. So, his is a two-pronged approach: shove people together to create pluralism; bust up dictatorships that don’t tolerate pluralism. He is deeply pained at this point that his new world order is falling apart everywhere, so he’ll push it harder, apply more money, to try to make it work. In my next article, I summarize the movements that are already forming to make that happen.